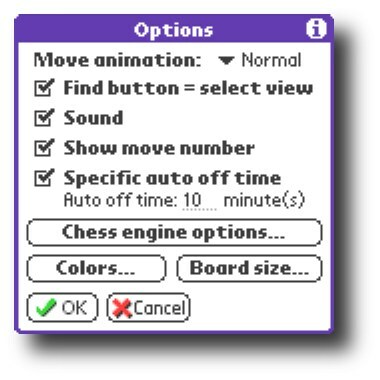 Chess board in full screen mode. 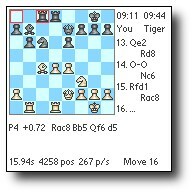 Black has just played Rook from a8 to c8. It is your turn to move (if the program was thinking you could see a small blinking sign at the bottom of the screen). Many thanks to Bryan Whitby who has generously donnated the beautiful "Challenger" piece set! Chess board in large view. In this view the clocks are visible, as well as the most commonly used icons. 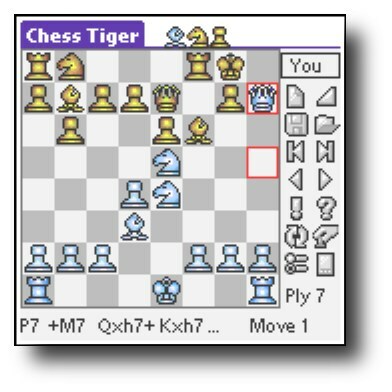 Chess board in normal view. This is the default view. 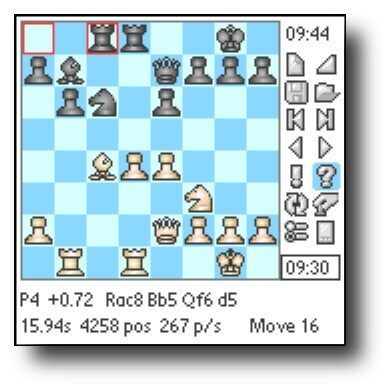 The most important functions are easily accessible by a single tap on the corresponding icon, the clocks are displayed, and the program is able to show the most important parts of its analysis just below the board. 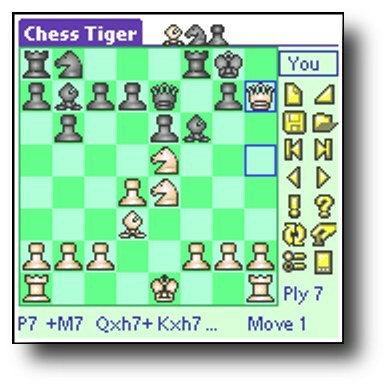 The captured pieces (if any) are visible at the top of the screen. Chess board in medium view with more info. 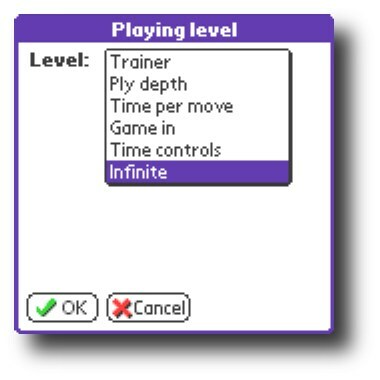 In this view the chess board is still of good size and the program is able to display more analysis information: thinking time, depth of analysis, total number of positions analyzed and number of positions per second. 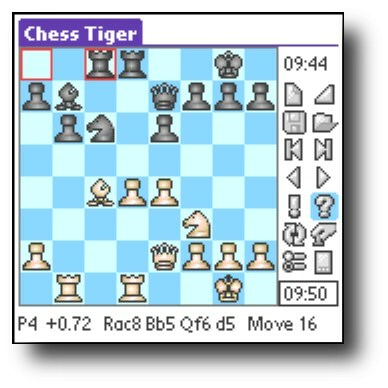 This view has been designed to maximize the amount of analysis information displayed by the chess engine. 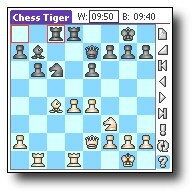 Up to 20 plies of analysis depth can be displayed (the next 10 moves for both sides). 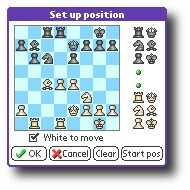 You can use this view if you let the program analyze a position for a long time. 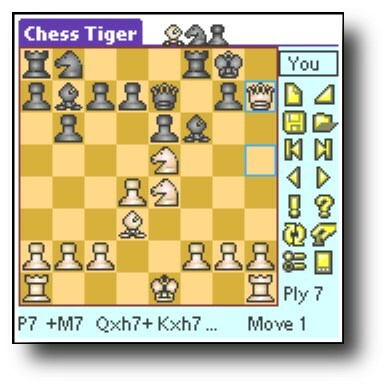 On this example, Chess Tiger has just found a mate in 7 moves starting with Queen takes h7, and you can see all the moves up to the final checkmate! Small view with move list. 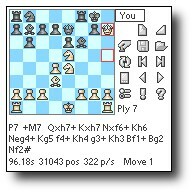 In this view a lot of analysis information is displayed, as well as the move list. When you tap on the new game icon , you are presented with this choice. 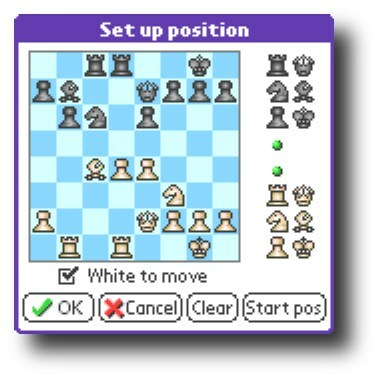 You can choose to play with the white or black pieces. 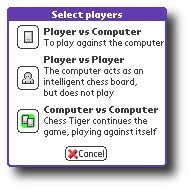 You can also select the "2 players" mode, which allows you to play against a friend (using your handheld as an intelligent chess board) or to replay a game (by entering the moves for both sides). 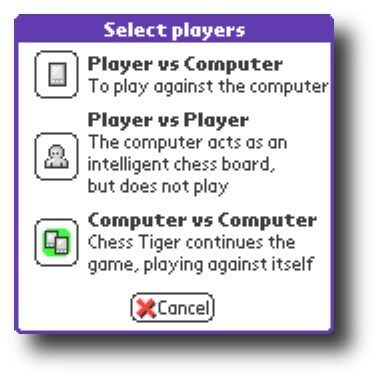 The last option allows you to replay a game while Chess Tiger analyzes continuously, allowing you to detect weak moves and telling you what alternate move was better. Chess Tiger allows you to play against it, to play against a friend, or to let you watch it play against itself. When you tap on the level icon , you are presented with this screen. Chess Tiger supports numerous playing levels, from easy trainer levels to official tournament time controls. Chess Tiger offers 8 trainer levels of increasing difficulty. The first levels play really weak and even make gross blunders on purpose. 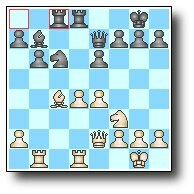 The last 4 levels (from 5 to 8) play much better but will still give you winning opportunities. 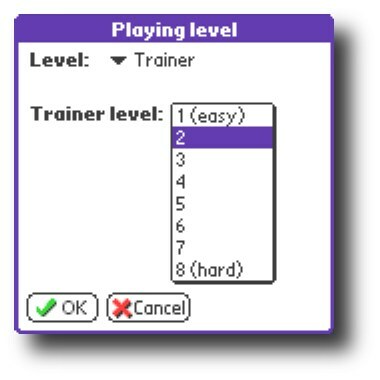 By using the trainer levels you can find an opponent of your strength and will never get bored. As your own strength improves, select a stronger trainer level that will force you to improve even further. 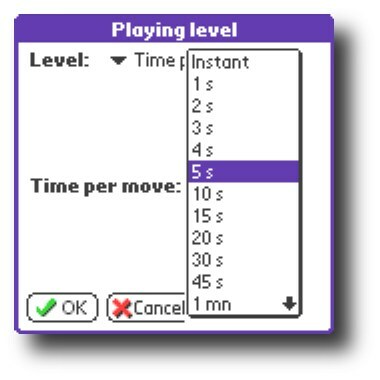 Here you can select the average time per move the program is allowed to think, from instant response to 3 minutes per move. Here you can select the total time the program is allowed to use for the whole game. 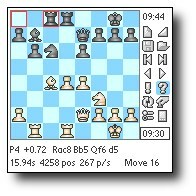 A popular "game in" setting is "blitz": each side has exactly 5 minutes to play the entire game. 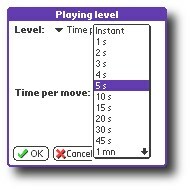 You also have the crazy "bullet" (1 minute to play the game). 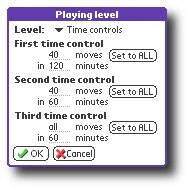 You can also select a more quiet and reasonable time control. 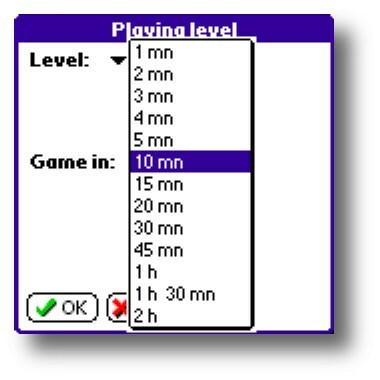 For example 30 minutes for each side, allowing a game to never last more than one hour. 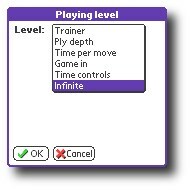 Here you can set real tournament time controls. 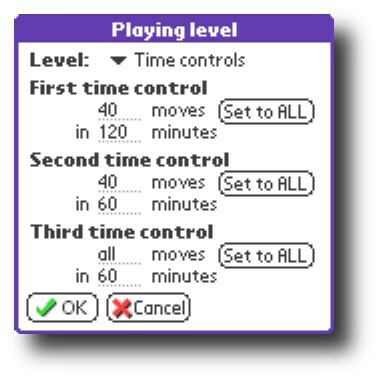 For example the screen shows that the first 40 moves must be played in 2 hours or less, that the next 40 moves must be played in one hour and that the rest of the game must be played within the following hour. 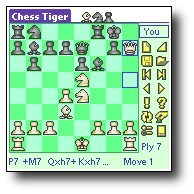 Chess Tiger allows you to set up any legal chess position. 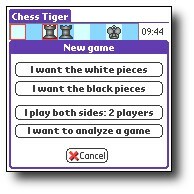 You can use this feature to enter newspapers' chess problems and let Chess Tiger solve them for you! Just drag the pieces from the side to their destination square, tell Chess Tiger whose side is to play and tap on "OK". It's even more convenient than with a real chess board! 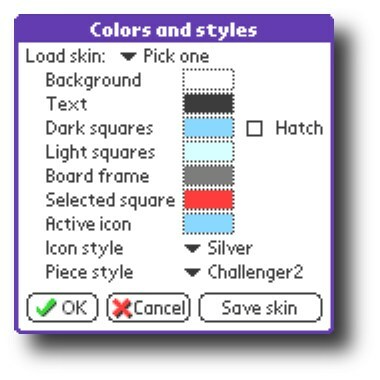 Here you can customize the behaviour of the graphical interface. 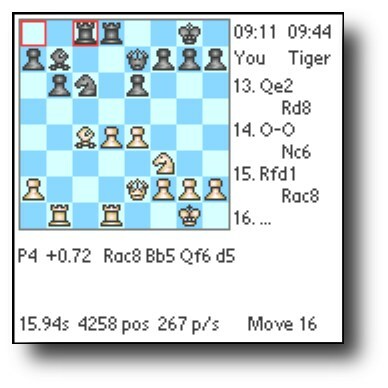 The "Find" button of your handheld (magnifying glass) can be optionally used to change the "view" (board size). Sound can be activated or not. 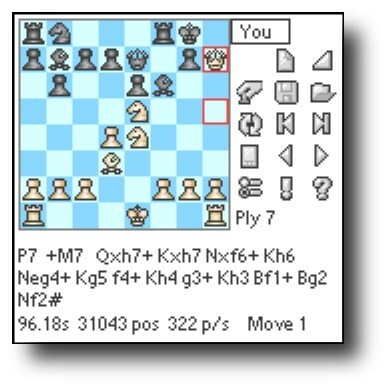 The program can show the move number at the bottom of the screen instead of "Thinking" or "Your turn". 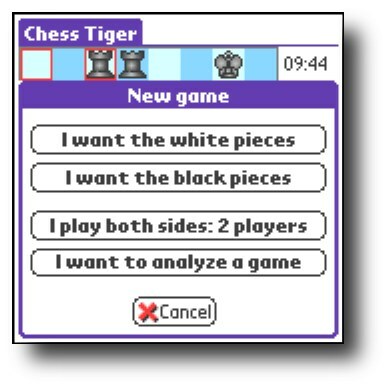 You can also select a specific auto-off time so your handheld does not turn itself off when Chess Tiger is thinking! 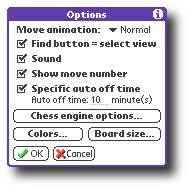 From this screen you can also access to the chess engine parameters screen, to the colors and styles screen and to the view selection screen. 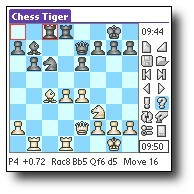 Here you can set the behaviour of Chess Tiger, from passive to aggressive or even suicidal playing style. 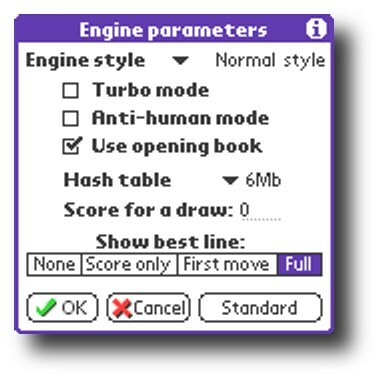 You can also turn the "Turbo mode" on to make the engine even stronger. Allow Chess Tiger to use more memory and it will play better ("hash table" setting, from 12Kb to 12Mb). 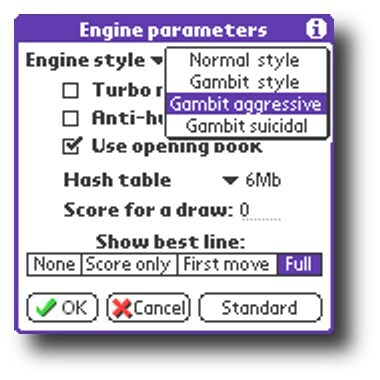 The "score for a draw" setting allows you to adjust the engine's tendency to play for a draw, or to avoid it at any cost. 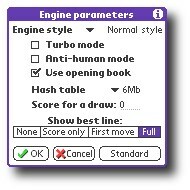 It is also possible to ask the engine to show all of its analysis, just a part of it or no analysis at all (if you do not want to be influenced). 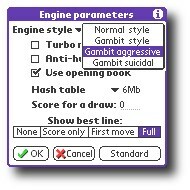 Gambit suicidal: if you can survive the attack you might be able to win! 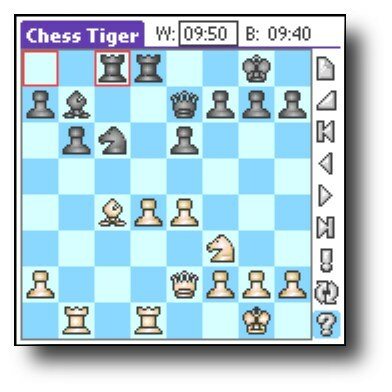 Chess Tiger offers a variety of chess pieces (5 sets), icon styles (3 sets) and colors (thousands). 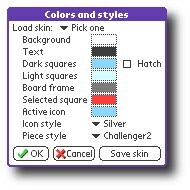 You can very easily customize the program to your taste or just use one of the 17 pre-defined styles.